I got an invitation to attend the Annual Chimes Crab Festival that happens every year in October. Sadly, I had to turn it down as I am a vegetarian. But team Chimes asked me to try their vegetarian options. That’s how I happened to visit Chimes. My Friend Jyothi and I went to Chimes for lunch recently. 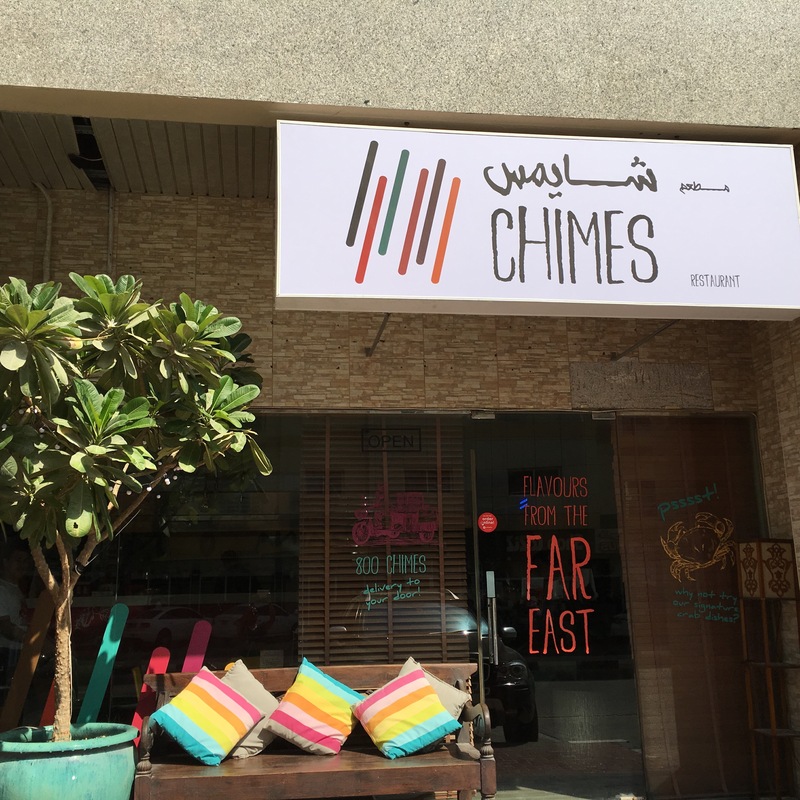 Chimes is located in one of the side streets, close to Mall of Emirates, in Barsha . Away from the hustle bustle of busy city. We could easily find the place, thanks to the GPS. Chimes is a Cosy little restaurant. It has an open kitchen concept. I love to watch my food being cooked and served fresh from the kitchen. We loved the decor of the restaurant. It has been done tastefully. The ambience is bright and cheerful. 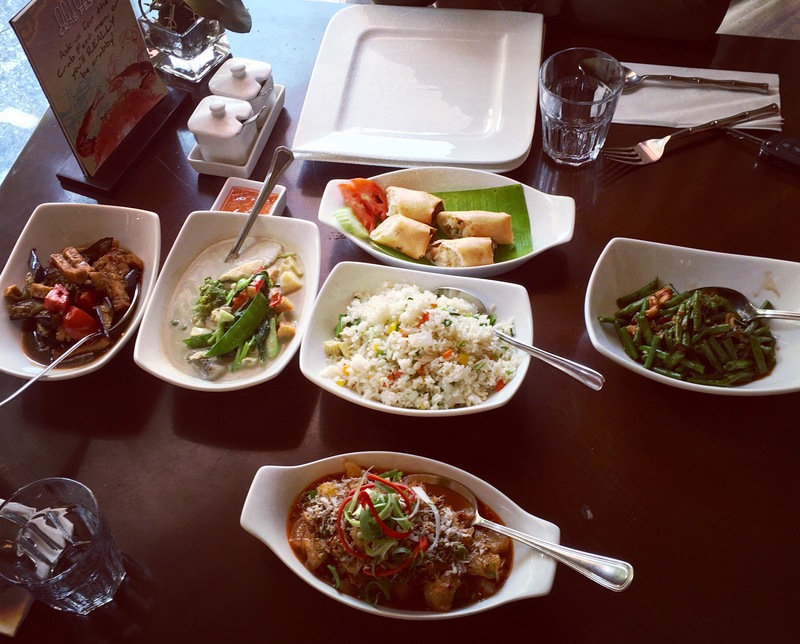 They offer Far Eastern Cuisine from the regions of Thailand, Malaysia, Singapore, Indonesia and Vietnam. Their specialty is seafood, but they also offer good vegetarian options. After settling ourselves in a Cosy little corner we decided to order our drinks. 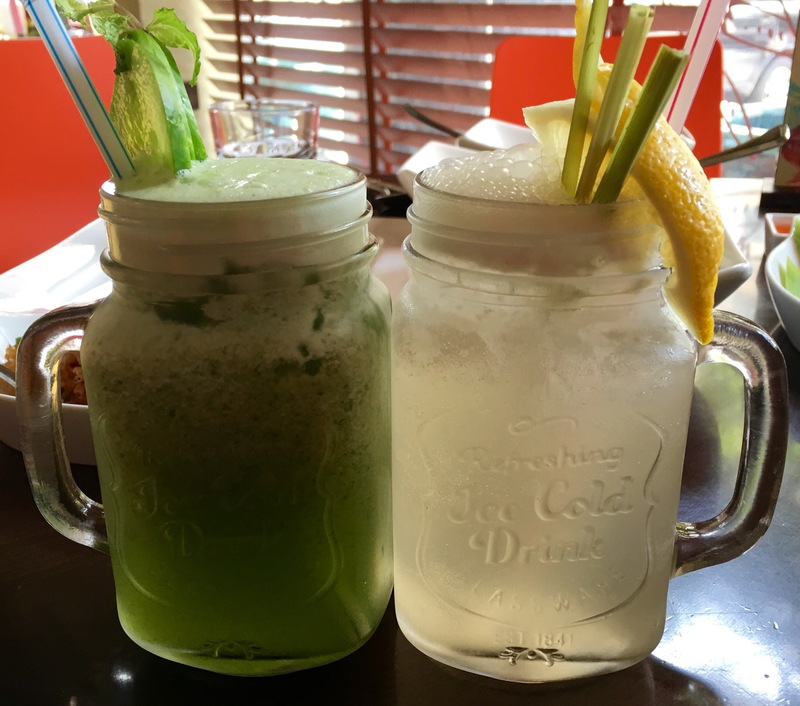 My friend ordered Aromatic Lemongrass juice and I ordered Cucumber Breeze. Our drinks were refreshing and delicious. The lemongrass juice is a must try. Cucumber Breeze was a bit sweet. The salads were the first to arrive, Green Beans and cashew nuts salad and Thai Pomelo salad. Green Beans and Cashew nuts salad was amazing. 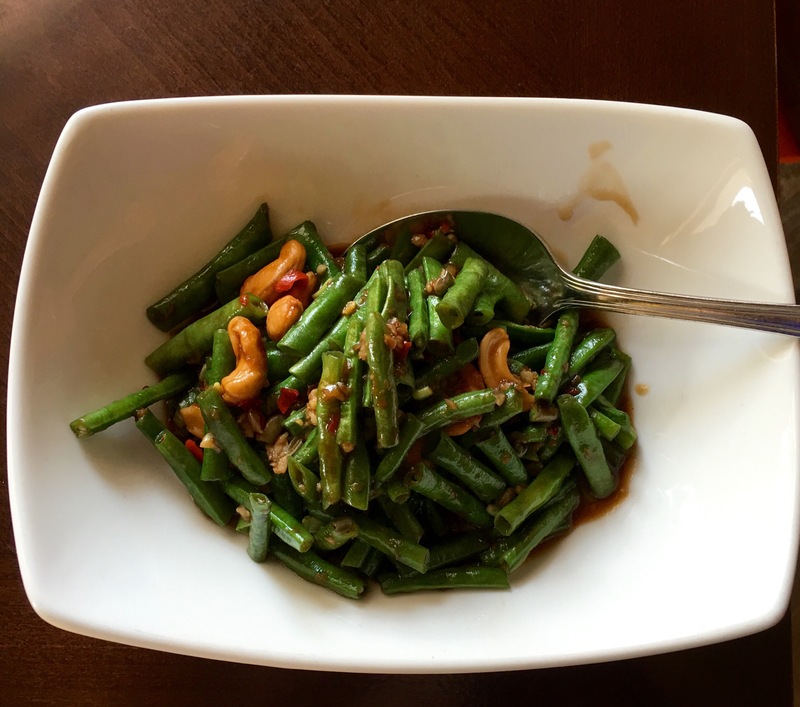 The fresh beans were crunchy and the combination with soy glazed cashews was perfect. The Dressing was full of Asian flavours. Thai Pomelo salad is made with prawns. But they made it vegetarian for us without the prawns. It is one of the authentic and popular Thai salad known as ‘Yum Som O’. 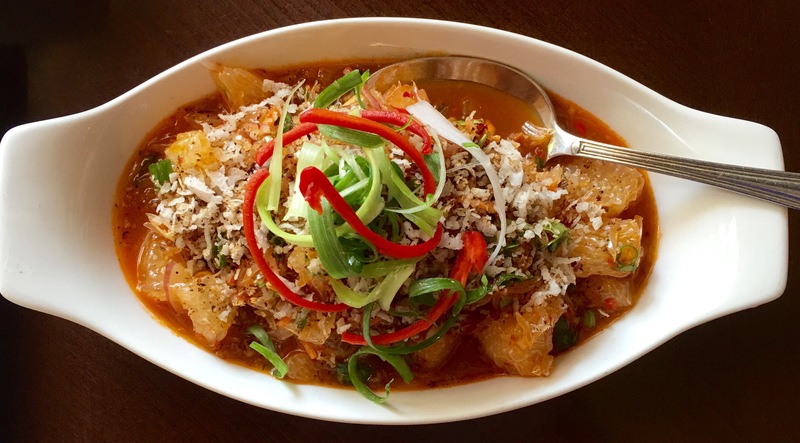 It was made with Juicy Pomelo, crispy coconut and corriander with tamarind dressing. It was light, tangy and tasty. We loved it. An absolute must try at Chimes. We had Veg Spring Rolls with honey plum sauce as our starter. 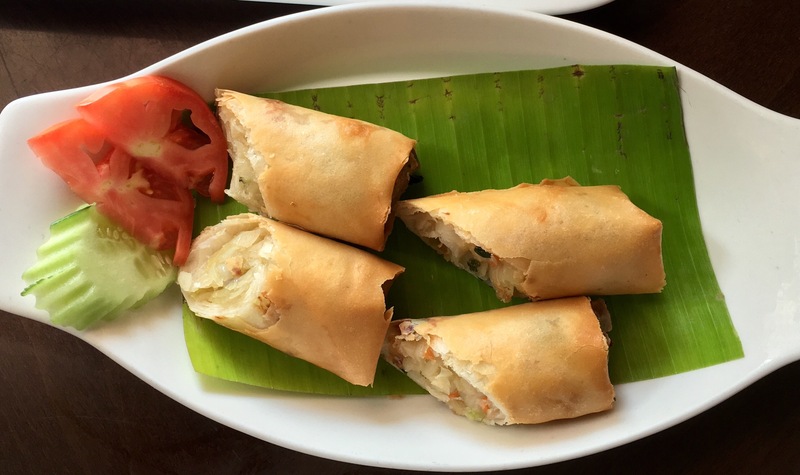 The spring rolls were crisp, well made and not oily. We had Thai Green Curry, Tofu and Eggplant and Vegetable Fried Rice for our main course. I must say that I must have had one of the best Thai green curry in Dubai. 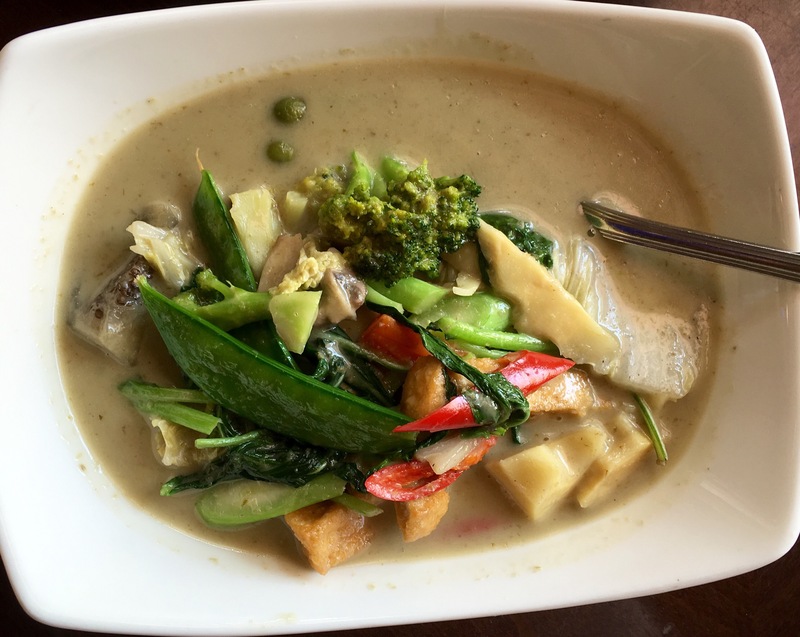 There was a mix of veggies like broccoli,beans, green eggplant and bamboo shoots in green coconut curry. It was perfectly spiced, aromatic and creamy. 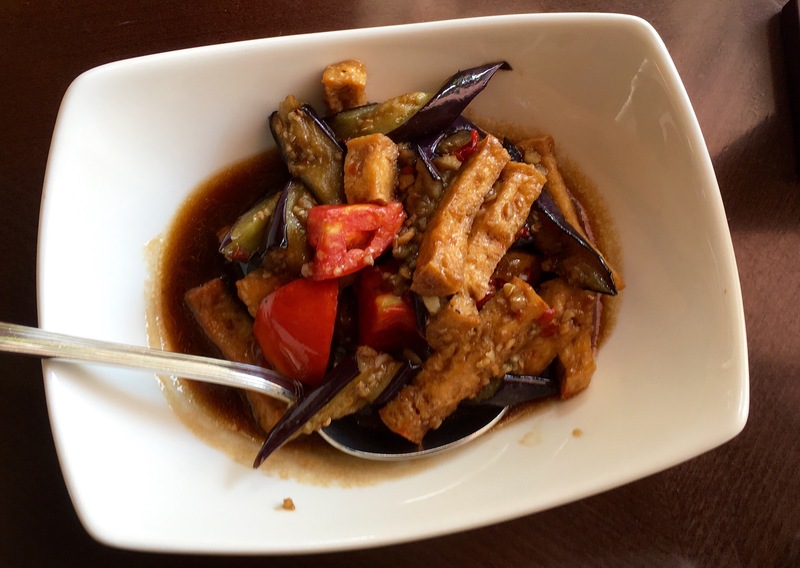 Tofu and Eggplant was cooked Indonesian style with thick Chilli and garlic sauce. It went well with the rice. The simple vegetable fried rice was freshly made and went well with the curries. A meal cannot be complete unless you have a sweet in the end. That is my motto. We had Thai Sweet Sticky Rice with Mango as our dessert. 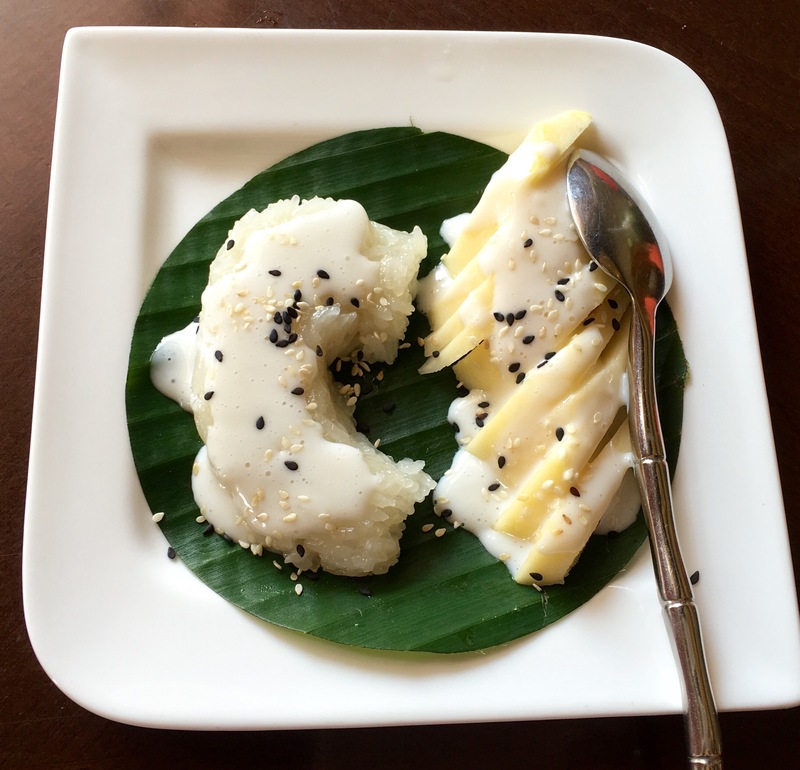 It had slices of ripe mango with sticky rice. This wonderful Thai dish makes a great dessert. We absolutely loved this sweet treat. The service is exceptionally good. The owner, manager and the staff are always around to help and assist you. The pricing is very affordable and the portion size is good. we really liked the fact that they only use the freshest of ingredients. Chimes offers exotic cuisines of Far East in a simple but elegant atmosphere. You can expect good service, affordable prices and delicious, flavourful and authentic food cooked with passion. If you are looking for a place that serves good food from Far East, then just head over to Chimes. We had an amazing experience and would love to come back again. I would definitely want to recommend this hidden gem in Barsha. Disclaimer- I was an invited guest at Chimes. But my reviews and opinions are honest and unbiased.